Back due to popular demand and in conjunction with Kitchenware Direct I have given away another a brand new Cuisinart Ice Cream Maker (valued at $119) in your choice of 7 colours PLUS to top that off the winner will also receive a Brookfarm Delights Hamper (valued at $70) thanks to Brookfarm! It’s almost summer and what better way to celebrate the season than with some homemade ice cream goodness. The best part of doing so is that you can customise your icy treat to whatever you fancy, avoiding excess sugar, additives and preservatives which often lurk around in commercially made ice creams. When I received my very own Cuisinart ice cream maker from Kitchenware Direct last year, I instantly fell in love with it and gave one away. We’ve had so much fun making up our own flavours: pumpkin and orange, cookies and cream, 5 ingredient rum and raisin (recipe to come) and fresh mint cookie choc chip. My most recent favourite in terms of flavours is this Muesli Frozen Yoghurt which I created for Brookfarm, using their delicious Toasted Cranberry Muesli – recipe to follow. It is packed with 17 wonderful ingredients and because it is already sweetened with bush honey and a little prune juice, you can avoid adding extra sugar to the yoghurt. Now, the Ice-Cream Maker Giveaway is back – making your own flavour possibilities endless! 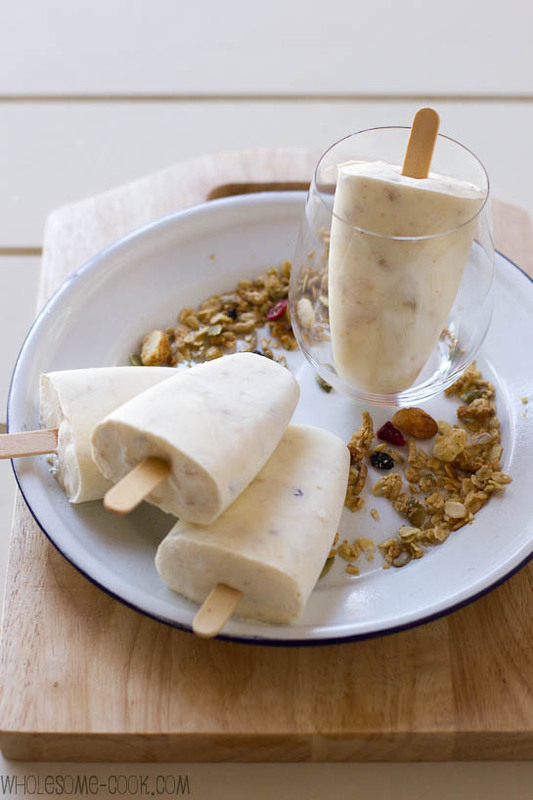 For those of you who don’t already have an ice cream maker: you can check out these Muesli Yoghurt Ice Pops on the Brookfarm website – no ice-cream maker needed! For those of you who would love to win one (CLOSED): continue reading to enter… Also, check out the Kitchenware Direct Ice-Cream Maker 101 post and some great offers on buying one. PS Kitchenware Direct are giving one away too (offers end midnight 2nd December)! PPS Oh, and did you know that Brookfarm also makes gluten-free muesli and porridge (Porrij) and has an online store? Leave a comment on this post telling me: EITHER what would be the first ice cream flavour you would make OR how do you enjoy your muesli? You must use the Rafflecopter widget or link below to register your entries. 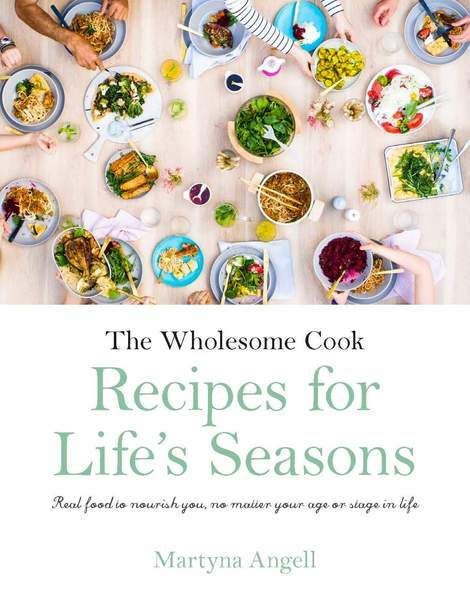 Ts & Cs Competition is open to readers with an Australian postal address only. Entries close 11:59pm Sydney time Sunday 9 December. Winner will be announced on this post on Monday 10 December and contacted by email. If there is no response within 48 hours from time of email, prize will be re-drawn. 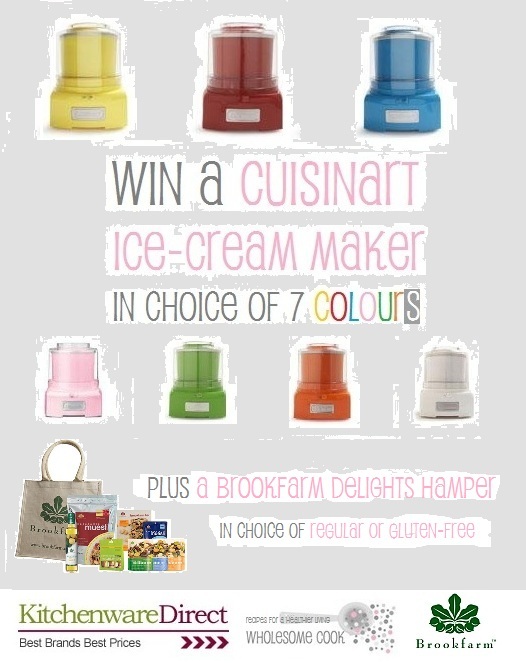 Prize includes 1 x Cuisinart Ice Cream Maker in your choice of 7 colours valued at $119 PLUS 1x Brookfarm Delights Hamper in choice of regular or gluten free valued at $70. You can earn multiple entries by completing some of the other tasks. The first flavour I would make would be a fresh mango and coconut to celebrate summer, YUM! Yummmm! I love ice cream!! Strawberry and balsamic! Perfect combination of sweet and sour. I would make vanilla with chocolate chips for my kids! And actually one of my favourite combos is vanilla ice cream with muesli. Glad to know I’m not the only one who likes that! I make my own muesli and enjoy it with greek yoghurt and honey. I would make mint with choc-chips, it’s my not so secret obsession! Pistachio, would be my first choice. Making good ol’ fashioned vanilla! And I love Bircher muesli, especially during summer. I am diabetic, so the first Icecream flavor I would make is an old time favorite “Chocolate”, without sugar or very little of course. To go with our tropical/hawaiian christmas theme this year I think I would have to make a pineapple coconut & lime gelato… very yum and very refreshing! I would love to make muesli! I had it in Germany and it has been on my bucket list to make! I’d eat it in the morning!! I like my muesli raw and unsweetened with skim milk. The first ice cream i’d make would be Jaffa. I used to have it once a week with my mother as a child, but alas, it is no longer readily available. As for muesli, i love my Brookfarm toasted cranberry muesli atop some really good quality Greek yoghurt. Simply divine. i would have to make chocolate icecream. a favourite. Blueberry cream ice cream! Sounds fantastic! Love the look of those muesli yoghurt pops! This first ice cream flavour i would make, would be Chocolate and Peanut butter. Definitely my favorite fruit strawberry! I would make peppermint to celebrate the start of December! The first ice cream flavour I’d make would definitely be Malaysian style teh tarik ice cream! I saw this recipe once and have always wondered how good it’ll taste. *ponders* Hmmmm… yum! And next would be green tea ice cream. Macadamia Nut ice cream would be what I make , Go down a treat on our 40 deg+ days . I find the best way to have muesli is with some high quality natural yoghurt, a tablespoon of chia seeds and some fresh fruit. My favourite combination of fruits in my morning muesli is blueberries, freshly sliced banana and a quartered strawberry. Divine! I recently went to The Channon markets in NSW and picked up some lovely macadamia nuts – so how about lemon myrtle and macadamia nut ice cream with macadamia praline sprinkled on top? Fruit ice cream something like blueberries. Toast and Marmalade Icecream !!!! I would love to make a rum, dark chocolate and raisin ice cream first. Then I would try various fruits for icecreams and gelatos! Strawberry and toasted coconut ice cream ! I like my muesli with some creamy greek yogurt with just a drizzle of honey topped with coconut flakes. I would whip up burnt caramel and bourbon ice cream …. yummmmmm! I would have to make a mango ice-cream, fresh, summery and perfect for those warm days sitting by the pool! Nothing beats vanilla ice cream with real vanilla pods, organic cream and milk …yum! You can have it straight or dressed up with strawberries and balsamic vinegar. Peppermint ice cream. It’s, by far, my favorite and I can never find it. I’d like to make peppermint choc-chip but i’m sure I’d be out-voted in my house and my children and husband would like chocolate! Coconut milk, banana & cinnamon! I would make Vanilla Bean ice cream … I can almost taste it! Oh, how CUTE are those icecream makers! Of course, it’s 40 deg. outside here, but I could still go for a delicious frozen pumpkin treat! I would make pumpkin ice cream, so seasonal right now!!! Raspberry. So easy and delicious. Always a hit with friends and family. Coffee Oreo. Hands down my favorite from a local ice cream shop, & mashing oreos into store bought ice cream just isn’t the same. I would absolutely make some sort of Amaretto ice cream first. Soooo good. ♥ Or murasaki imo (purple Okinawan sweet potato, a flavor which I’ve found, on occasion, in Japan but never in the US). They grow in my parents’ garden, but I’ve never seen it as an ice cream flavor stateside! I would love to try a Chai Tea flavoured ice cream first go! My favourite icecream is kaffir lime and coconut, so that is what I would make…perfect to cool the tastebuds after a screaming hot Pad Prik StirFry…best summer dish ever! I’ve had my eye on the pink Cuisinart ice cream maker for a few weeks and I’d definitely start with a dairy free ice cream based on coconut milk, with added fresh dates and caramelised banana. it’d have to be earl grey and mint sorbet. traditionally served back in the victorian days, this sorbet is just so refreshing!! Definitely mango and cream ice cream for me, but I’m sure the kids would demand chocolate and cookie dough! The mangoes on my tree will be ripe very soon so perfect timing to make mango icecream. First Ice cream flavor I would make is Dark Chocolate fudge. yummmmmmmmmmm! I’d be all over making a salted caramel flavor! The first ice cream I’d attempt to make would be chocolate coffee flavour ice cream, makes me want some just thinking about it. It would have to be mango and toasted almonds, topped with a dribble of Irish Cream… wickedly delicious! I would embark on my quest to replicate the magnificent PEACH AND CHAMPAGNE ice cream I had once in Rome… haven’t found it anywhere since. I would make vanilla first following the instructions in the book because I am compulsive like that :0) BUT then I would try my hand at making some chocolate icecream with cherries and coconut or apricot and honey macadamia – there was a shop near us that sold the apricot one when I was growing up – yum! I love my muesli with the freshest local raspberries, dollops of the best local vanilla yoghurt and just a dash of milk. Breakfast or dessert – either way it’s just divine! Mango is my favourite summer fruit. Mango ice-cream would be refreshingly delicious! the first ice cream I would make would be a new one I recently concocted as a smoothie.. then decided it made perfect sense frozen… its made with a pina colada type mix or fruit purees and juices and your fave almond milk… 1/2 ratio with a 1/2 tsp fresh nutmeg.. it is awesome if I do say so myself! Reading your recipe for rum and raisin icecream has left me salivating, definitely rum and raisin! The first ice cream I would make would be Turkish rose syrup with cardamom and pistachios. The best ice-cream I EVER had was pistachio ice-cream in Pisa Italy and was reminded of it today watching Global Village Visions of Italy on SBS On Demand. And now the question of which ice-cream I would make first – has to be pistachio of course! It would have to be mango! I love mango ice cream! I would love to make a chai and pumpkin flavored ice cream! I think the flavors would go so well together! The first ice cream flavor I would make would be salted caramel ice cream! Yum! Peanut butter and Chocolate. The most heavenly combination! I love my muesli with LOTS of vanilla yoghurt!!! yummy!! Salted Caramel ice cream would be divine! I’d make vanilla bean ice cream. Mint ice cream…. love, love, love them!!! I would be making Mint Choc Chip. Delicious! Chocolate would be my first one – simple but oh so good! I would do zabaglione!! Amazing with almonds or strawberries!!!! First flavor I would make would be egg nog ice cream. Always wanted to make an avocado ice cream, yum! I love muesli either on its own (if it’s REALLY good), or made into a parfait with – if winter, warm poached apples and yoghurt with sultanas; if summer – mangoes, every kind of berry I can lay my hands on, and dried cranberries. Was the winner ever announced?